Xinhua: “Vice Premier Li Keqiang on Wednesday called for more support to Xinjiang Uygur Autonomous Region to achieve leapfrog development and long-term stability in this westernmost region of China. Li made the remarks at the 3rd National Work Conference on “pairing assistance” projects to support Xinjiang’s development. President Hu Jintao met the delegates to the annual conference and thanked them for their efforts made in accelerating Xinjiang’s development. Premier Wen Jiabao and Vice President Xi Jinping, both members of the Standing Committee of the Political Bureau of the Communist Party of China CPC Central Committee, were present at the meeting. Zhou Yongkang, also member of the Standing Committee of the Political Bureau of the CPC Central Committee, also met with the delegates and attended the conference. Huge achievements have been made in the past two years under a large number of pairing assistance projects for Xinjiang, especially projects concerning Xinjiang people’s well-being, said Li, also a member of the Standing Committee of the Political Bureau of the CPC Central Committee. Vast land, abundant resources and huge development potential make Xinjiang a major area to implement China’s strategy to expand domestic demand and the strategy to develop the country’s western regions, Li said, adding Xinjiang is also a key area to accommodate transfer of domestic industries. Xinjiang is one of the bridgeheads for China’s opening to central Asia and Europe, said Li, calling for speeding up the opening of China’s western border areas while enhancing the openness of its eastern coastal regions. via Senior leader says to promote Xinjiangs leapfrog development – Xinhua | English.news.cn. 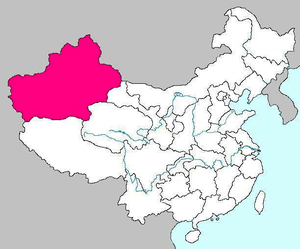 Xinjiang and Tibet are the two areas where ethnic minorities do not see eye to eye with the Han majority. Interestingly, both are strong adherents of religion; Buddhism in the case of Tibet and Islam in the case of Xinjiang. Until and unless the central authorities can convince these minorities that they have some form of self-determination (after all both are called ‘autonomous regions’ of China), unrest will continue.